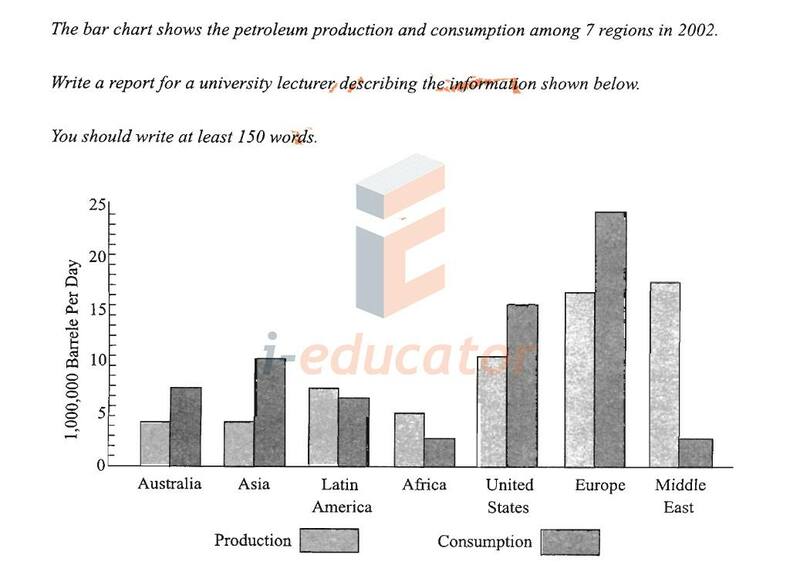 Đề bài: The bar chart shows the petroleum production and consumption among 7 regions in 2002. 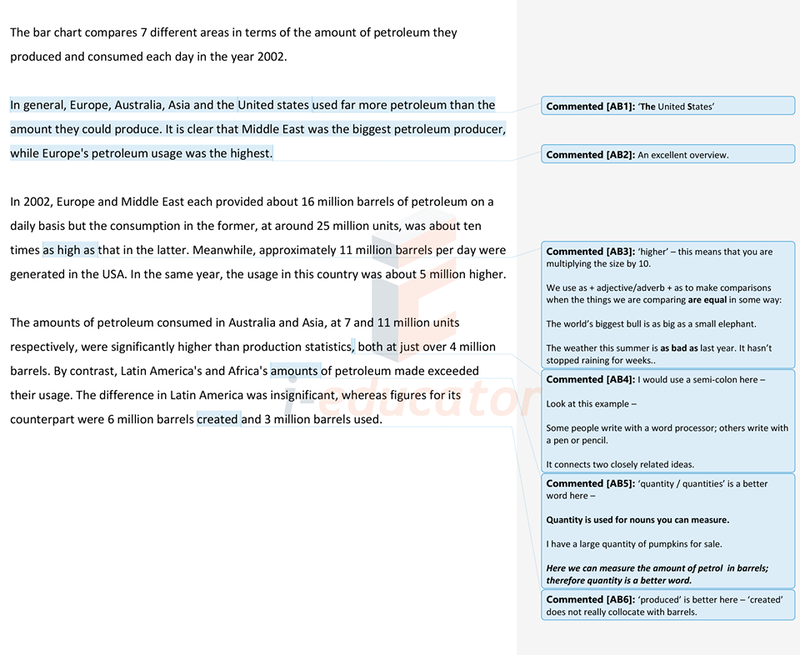 In general, Europe, Australia, Asia and the United States used far more petroleum than the amount they could produce. It is clear that Middle East was the biggest petroleum producer, while Europe's petroleum usage was the highest. The consumption in the former, at around 25 million units, was about ten times as high as that in the latter. In the same year, the usage in this country was about 5 million higher. The amounts of petroleum consumed in Australia and Asia, at 7 and 11 million units respectively, were significantly higher than production statistics, both at just over 4 million barrels. In 2002, Europe and Middle East each provided about 16 million barrels of petroleum on a daily basis. Meanwhile, approximately 11 million barrels per day were generated in the USA. Figures for its counterpart were 6 million barrels created and 3 million barrels used. In 2002, Europe and Middle East each provided about 16 million barrels of petroleum on a daily basis but the consumption in the former (Europe), at around 25 million units, was about ten times as high as that in the latter (Middle East). Meanwhile, approximately 11 million barrels per day were generated in the USA. In the same year, the usage in this country (the USA) was about 5 million higher. By contrast, Latin America's and Africa's amounts of petroleum made exceeded their usage. By contrast, Latin America's and Africa's amounts of petroleum made exceeded their usage. The difference in Latin America was insignificant, whereas figures for its counterpart (Africa) were 6 million barrels created and 3 million barrels used.